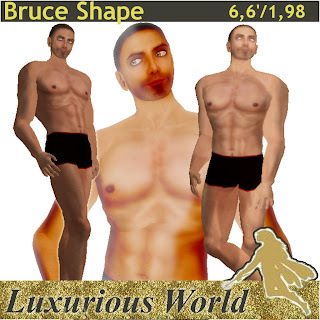 Shapes SALES at Luxurious World at Cassiopeia’s location!! All Shapes at Cassiopeia’s store are marked down to 50$L!!! MEN AND WOMEN SHAPES!! Modify/no transfer and no modify/transfer! Basic Wool Turtleneck Sweater for Men and Dollarbie!! All men needs a warm wool sweater for the Winter and so here it is!!! :) In 4 great colours, this amazing wool turtleneck sweaters come in 2 wearable layers and include sculpted sleeves and collar (with a resizer script). For only 30$L you can have yours! Wear without moderation all Winter!!! Come get the new goodie at the Item chair!! Just camp for 30 min and grab a cute Nightwear set!! 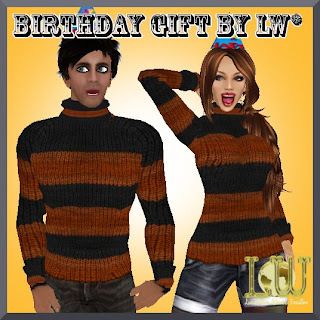 Last day to grab my birthday gift to you all and the Halloween freebie! !Tomorrow they will be gone!